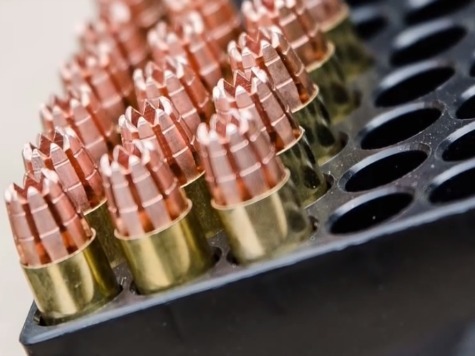 G2R Ammo has developed a new type of ammunition called “Radically Invasion Projectile” (RIP) ammo intended to ‘maximize lethal potential’ for citizens in self-defense situations. Note: it is not simply a new line of ammunition but an entirely new kind of ammunition. The “cartridge” for 9mm RIP ammo is a “96 grain, CNC machined, solid copper, lead-free projectile.” It provides the penetration of full metal jacket ammunition with the effectiveness of fragmentation; possible because of the “trocar” designed, three-sided edges that break off during penetration and create their own path through the target. The tips of the “trocar” edges are saw-like, which helps the bullet cut through “plywood, auto glass, sheetrock, cinder block, sheet metal, [and] multiple layers of denim [or clothing]” before fragmentation begins. For self-defense purposes, fragmentation is designed to send a shock-wave through the attacker’s body at the point of entry.